For this vegan-friendly snack, chef Asher takes advantage of the natural rich creaminess of almonds to mimic the mouthfeel of sour cream. 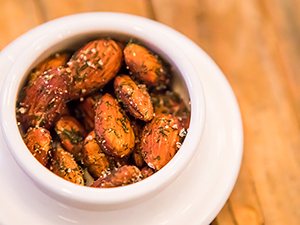 After roasting the almonds to enhance their flavor, he tosses them with savory spices and salt. The result tastes like sour cream and onion potato chips but makes for more nutritious munching. 1. Preheat oven to 400 F. Line sheet tray with brown parchment paper. Toss almonds with ¼ cup oil and lay out in a single layer on sheet tray. 2. Roast almonds about 12 minutes until they turn slightly browner and smell nicely toasted with a rich aroma. 3. Remove almonds from oven; transfer to large stainless-steel bowl. Toss with remaining ¼ cup oil. 4. Place almonds in a brown paper bag; toss with spices and salt, shaking vigorously to coat well. Cool slightly before serving.